Originally uploaded by daniel arnold! Quick word on the release of Munir Hussain, the rich businessman who was jailed for severely beating an intruder who had kidnapped his family at knife-point, but has now been freed on appeal. I stumbled across this quote from Francis Bacon, the Elizabethan philosopher, which questions the popular perception that Hussain might have suffered rough justice the first time around. 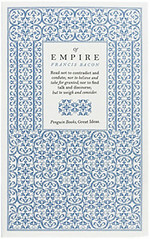 Although I have sympathy with any man who tries to defend his family, I though thought the wisdom of Bacon to be apt. “Revenge is a kind of wild justice; which the more man’s nature runs to, the more ought law to weed it out” (Francis Bacon, ‘On Revenge’). How far do Renaissance revenge tragedies endorse Bacon’s claim?